You can’t underestimate the power of a good walk. When I was in college, I walked all over the University of Kansas campus. Sometimes it was 30 minutes to my farthest class. Often there were 10-minute hikes between classes with hills or dozens of steps to climb. Then of course the 30-minute jaunt home again. It was no wonder that I was in awesome shape — I was power-walking well over an hour every single day! 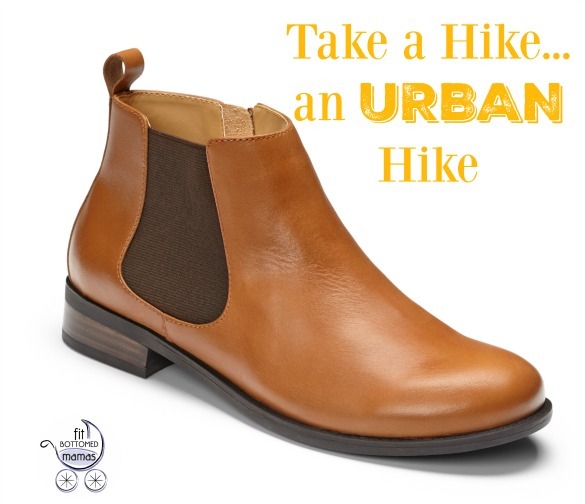 I was also way ahead of the trend — the urban hike trend as “they” are now calling it. I always think back to that time when I’m slacking on fitting in gym or home workouts. As long as I’m walking, getting outside in some fashion, walking to run errands, walking fast even when I’m not in a hurry — I figure it’s something. And with how busy life is right now, something sometimes has to be enough. Even if you don’t consider a short urban hike a workout, it is, so Vionic Innovation Lab expert Brian Hoke, Sports Physical Therapy Specialist, recommends giving your feet some TLC. Kick off your shoes, flex your toes back and forth and give your heels a mini-massage. Roll your ankles around, do a calf stretch to minimize any muscle cramping and shortening, thereby relieving lower body and foot pain.